Debate about climate change and the continuing and relentless search for fossil fuels fills the headlines, but relatively little is known about the people most affected. Little is known, too, of the Arctic Circle culture at risk, and the natural resources that sustain its native peoples. This book records the experiences of native Arctic tribes (Gwich’in, Inupiat, and Inuvialuit) and inhabitants who came to the Arctic from other regions, and how these peoples are affected by the endless quest for oil and gas. In so doing, it also uncovers how their ties to land and sea contribute to their survival and well-being. 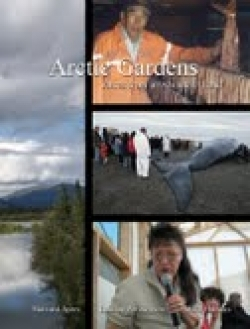 The book is published by Arctic Voices, an organization which defines itself as “an international group of citizens who provide a voice for the cultures, the wildlife, and the land of the Arctic of Alaska and adjacent Canada.” The authors, as part of the Arctic Voices project, have collected interviews from people living in the Arctic and directly experiencing the cultural toll of global warming and the environmental degradation that comes with oil and gas exploration. These interviews not only demonstrate how fragile the subsistence economy is at the hands of industry and an ignorant public, but also how robust it has been over generations in keeping a hardy people alive and thriving in what most think of as a supremely hostile environment. This book will interest not just the environmentalist and anthropologist but also historians, activists, and students of culture. Traditional methods of taking game and preserving food, the clash of ancient cultural traditions against the modern lures of “civilization,” and the fierce independence of the people who gave their time and stories all make for a fascinating journey into a land that most will never see. The pages are graced with 154 illustrations, but in black and white they suffer, particularly a photo of rainbows that are completely invisible; a recently available e-book contains the color versions. Both projects are worthy, their executions thorough and well worthwhile.